If you were in the Loveland area around 8:00 p.m. you may have heard an enormous roar. It wasn’t an explosion, nor a low flying airplane. 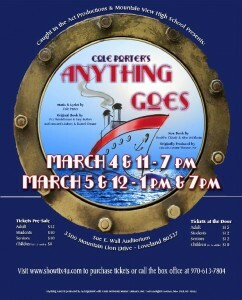 It was the thunderous applause provided by the audience at the conclusion of the first act of Mountain View High School’s production of “Anything Goes!” The entire cast is on stage tap dancing their hearts out with a remarkable display of talent and exuberance! This is one of the most delightful first act finales of a show in recent memory. “Lady” Is More Than “Fair” – She’s Exceptional! “The Flea and the Professor” Is An Event Of Delightful Fantasy.